As part of his PhD studies at the University of Minnesota, Kinesiology Department, Dr Mike T. Nelson looked at the impact of a particular energy drink (Monster) on heart rate, heart rate variability (HRV) and ride time to exhaustion in young recreationally active men & women. The team hypothesized that since most energy drinks contain carbohydrates and caffeine as their active ingredients that a 16 oz can of Monster would allow the subjects to ride for longer before they became exhausted and that perhaps their pain perception (RPE) would be lower. They wanted to see whether the riders resting HR & HRV would be altered, whether they would achieve higher maximum heart rates, and whether their metabolism started to favor fats or carbs more as a fuel source. This was compared to control subjects who had not had the energy drink. The tests were conducted using the randomized double blind crossover design. All 15 subjects would perform the test twice (with > 7d in between) without knowing whether they had drunk the energy drink or an alternative artificially sweetened drink that contained no caffeine. After an 8 hour fast, subjects drank either the energy drink or the control. The amount of energy drink was designed to give a dose of 2mg caffeine per Kg of body weight (so big people drank more, and lighter ones less). Preliminary testing was used to measure their resting HR, HRV. During the exercise testing sessions the participants finished the drink 60 minutes before starting on the stationary bikes. After a 5 minute warmup, they followed a staged ramp up of intensity over the next 30 minutes followed by pedaling at threshold intensity until they could manage no more (these tests are always fun to participate in!). Although many sports enthusiasts would expect to be given ‘wings’ by consuming energy drinks before training or competition, Dr Nelson’s team found remarkably little difference between the subjects who had taken the drink and those who had not. Ride time to exhaustion and maximal HR were not increased, nor was the effort any less painful after consuming energy drink. In fact the only significant difference they found was in resting heart rate, which increased after consuming the energy drink. They looked at multiple HRV parameters, including the RMSSD measure used by ithlete, and found no significant difference. 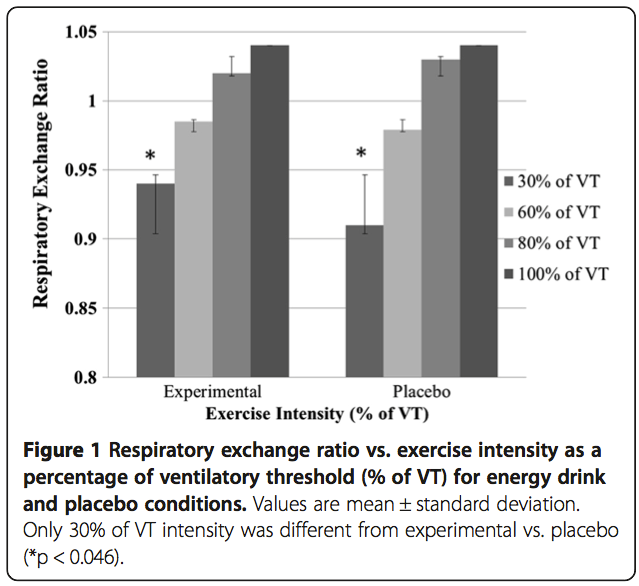 They did also find a small difference in respiratory exchange ratio (RER) at low exercise intensity. RER is a good way of determining the mix of fuel being used, with a higher number (close to 1.0) indicating more emphasis on carbohydrates, and a lower number (0.5-0.7) indicating significant contribution from fats. Endurance athletes habitually down double espresso coffees in the expectation that they can go harder with less feelings of fatigue, and many people think of a large can of energy drink as being an abundant supply of caffeine. This study showed the latter not to be the case, and the authors’ explanation of why they failed to find such effects being due to both the relatively low dose of caffeine the drink contained (2mg vs 3-9 mg / kg doses in other caffeine exercise studies), and a possible confounding influence of the amino acid Taurine, often present in energy drinks. Moderate doses of caffeine are usually associated with increases in HRV (e.g. RMSSD), and an increased ability to use fat as a fuel source, which the increased RER here did not show. In conclusion, if you want to get the benefits of caffeine during exercise, you are probably better off with the traditional espresso than the latest can of energy drink. Thanks for the great write up Simon and spot on! I was surprised that HRV did not change, but the research as you know on caffeine in its various forms and HRV is all over the map. Resting HR did go up a bit though. Happy to answer any questions here from others. It should be noted that we used a ride time to exhaustion (TTE) as it matched the earlier caffeine data. In a perfect world, more highly trained subjects and a time trial format would be a better comparison to athletic performance.